I still remember when I was a little girl, I was always fascinated with a keyboard. As time went by, my fascination moved from one thing or another, but my fascination for Casio never died. It took me a long time to convince my parents to pick me one, and it is when I finished the 12th standard that I got a beautiful black keyboard as a reward for my efforts in the boards. As a parent, I often read and understand things on how to let my kids develop better and I came across a very interesting piece of info that I would like to share with my readers. 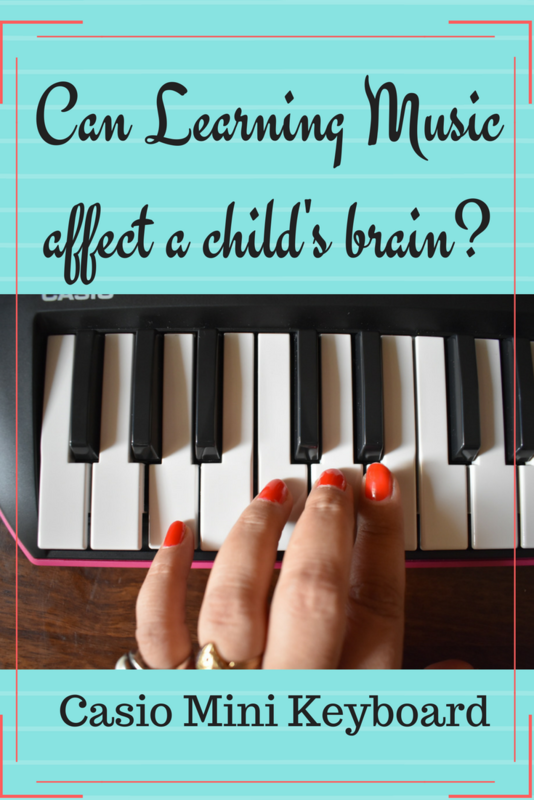 Learning Music affects a child’s brain in multiple ways, and all positive ones at that. Let us see how Casio Mini Keyboard can be one of the best options available. Nursery rhymes are often included in every child’s early learning curriculum. The simple reason being that music and singing play a crucial role in how a child’s brain develops. Music often touches several parts of the brain, often at once, helping exercise those sections and developing them in the process. As per my observation of current trends in the cities, parents encourage dancing or even singing more than playing an instrument. Back in the day, music instruments like the dholak, or the harmonium were often found in every household. the use of Musical instruments has pretty much declined with the rise of Dance and other modern-day sports like skating. But this is my personal observation and may be subject to limitation. Child Development experts believe that learning how to play a musical instrument helps a child’s brain develop tremendously. These developments not just focus on learning and concentration, but affect multiple social and academic abilities of a child. As per National Association of Music Merchants Foundation (NAMM Foundation), learning to play an instrument can improve mathematical learning and even increase educational scores. Music stimulates all areas of a child’s brain, enabling development and skills for school readiness. Intellectual, social and emotional, motor, language, and overall literacy of a child gains benefit from learning to play an instrument. It helps the body and mind to work together. Hence, abilities like better concentration improved fine motor ability and being able to soothe themselves and detach from an unpleasant environment are just some of the by-products of a pleasurable activity of learning how to play an instrument. It is a pocket-friendly and durable alternative to other kinds of musical instruments or musical toys. Even if the child does not know how to play, they can initially familiarize themselves with the instrument. The Casio Mini Keyboard has 50 tones and 30 rhythms preset. It also has 50 song back tunes and 5 drum pads. The child can pretty much make their own music and have a great time engaging with the Casio mini keyboard. If you liked reading this article, do SHARE it ahead! I think music can really make a difference and its important to introduce kids to music early on. Love the expressions there. And yes I completely agree. Music plays a very important role in each person’s life – old or young. Thanks you so much for such an informative post! Music is indeed eternal and can make wonders when introduced appropriately. Indeed learning music is something every child loves and it helps them grow creatively and helps them a lot in focussing. Music really soothes the mind and is a perfect healing therapy too. It is also said that music calms the hyper active impulses of a child and is perfect for them. Learning music from an early age improves creativity, concentration and focus. It can also deviate kids from other not so good things like computer games and all. I agree learning music is really great at any age whether young or old age. Music can really help in a child’s development in so many ways. I too have introduced my girls to Casio keyboard and we get to enjoy our time together. Listening to music works even when the baby is in the womb. I definitely believe it works wonders for a child’s development. Extremely informative post. New bloggers definitely miss such well explained tutorial articles. More posts from your side is expected from readers of your blog. Sounds really interesting! I didn’t know music is scientifically related to brain development . My son is 4 and he loves playing and creating music. I would like him to try Casio mini too.